ISAT and Kinetics vibration isolation air mounts. There is NONE BETTER for Engineering services, manufacturing and testing capabilities - all backed by the industry’s most experienced staff. 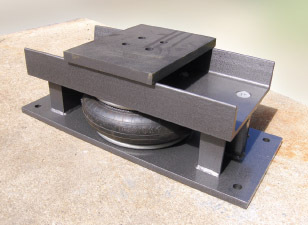 Kinetics air mounts are pneumatic, elastomeric vibration mounts. The CAM is available in four (4) sizes supporting loads up to 7,500 lbs. The KAM is available in seven (7) sizes with capacities from 500 to 22,000 lbs. per mount. Both models are optionally available with automatic leveling controls and custom mounting to meet your specific needs. Typical applications include mechanical equipment and industrial process equipment requiring low natural frequency isolation, as well as protecting sensitive equipment from disturbing floor-borne vibration.